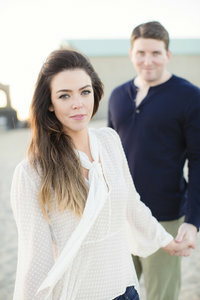 I’m so excited to share these Monmouth University engagement photos with Erica and Matthew! Their warm, romantic and fun relationship really came through in these photos and I simply cannot wait for their wedding next year! Matt and I met at James Caldwell High School (he was a sophomore and I was a junior). My best friend was “dating” his twin brother at the time and I thought it would be fun to ask Matt to prom so that we could take pictures together with the twins. We didn’t actually start dating until my senior year (Matt’s junior year) in 2008 and have been together ever since! Our two-week honeymoon in Italy and creating a beautiful home together! Back in March we decided to take a day trip to my alma mater, Monmouth University (something we do often). We stopped at Rook Coffee, walked around the entire campus, took a bunch of pictures, and ended our tour in Wilson Hall. Matt asked if we could go to the gardens before we left, he got down on one knee asked if I would marry him!! There was no one around (just us) and it was the most perfect moment. He even set up a dinner for us and our families to celebrate as soon as we got home from Monmouth!! In the summer of 2016 we took a trip to California to drive up the Pacific Coast Highway. It was our first big adventure together. Our trip began in San Diego and took us all the way up the coast to the Napa Valley, traveling through Los Angeles, Santa Barbara, Big Sur, Carmel by the Sea, and San Francisco in between. While we had a blast at each stop along the way, some of the best parts of the trip were in the car on our way to the next destination. We took countless unexpected pit stops to take in the beautiful sights together from the rolling hills, the various sea life, waterfalls, and even zebras! It is a trip that we couldn’t imagine experiencing without your best friend. When I first met Matt in high school, one of the first things that attracted me to him was his confidence, drive and work ethic. I watched him put his head down, work hard, never complain, achieve his goals in all aspects of life (work, academics, athletics & relationships) and NEVER brag about his accomplishments. This still holds true ten years later and I love him for it! Aside from Erica being beautiful, she has always amazed me with her ability to make anyone feel important.